The rapid development of technology has raised many questions about how creativity will evolve alongside it. 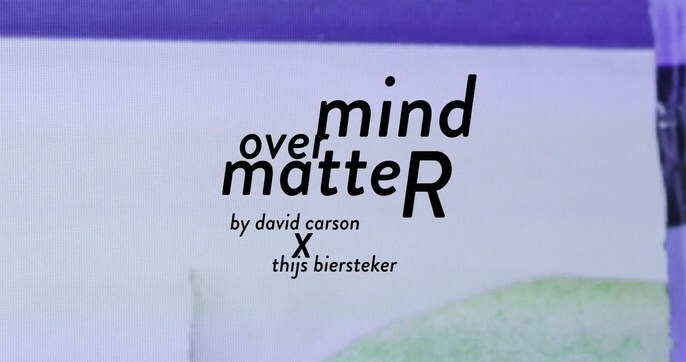 David Carson’s collaborative exhibition, “Mind Over Matter,” with Thjis Biersteker, showcases that technology can help push the limits of how art is experienced and the influence it has on the viewer. The concept began with the artists' mutual desire to create art that has a real impact on the world. The project evolved through an emotionally-driven creative process to draw into question modern paradigms in society such as the practice of mindfulness, the visualization of emotions, group dynamics, and peer surveillance. The partnership began while David was doing an artist residency program at the Zeoku Hotel in Amsterdam. Given David’s well-known background as a professional surfer, Thjis was in charge of showing David the beach. Thjis explained his background in tech-driven art and expressed his eagerness to collaborate on a piece with David. Their process started with the desire to clean up pollution. They began by collecting trash from around Amsterdam that David later used to create collages. Thjis, using his technological-art background, connected digital copies of the pieces David designed to a headset capable of reading brain-waves. Through this technology, the visuals were programmed to reflect the mood of the people using the headsets. Once they had tested and fine-tuned their installation, they invited a small group to experience the piece in action. When David and Thjis saw how people interacted with their piece, they realized that the scope of the project had become much larger than they had anticipated. People in the exhibit begin to be mindful and actively exercise control their thoughts. The experience was so unique that the team could not ignore the power it was having over the viewer. “[It is] just something [else] to see your mind get calm,” David explained, “you feel it but you don’t often see it. If somebody would enter the room, and one person started doing something different, that affected it. I think we just kind of touched the surface but there’s something really interesting there. An obvious [application] would be meditation and self-calming. What was also interesting [was] that there were some people there that started reading the other people there like: ‘woah, you’re in a dark place.’ Or, ‘wow, that person is really calm.’ Or, ‘what the heck is going on in there?’”. The reality that David and Thjis did not know how their project would be interpreted before they put it in action was not a problem for David. Rather, he views it as an exciting marriage between human experience and technology, as well as a testament to the power of emotional art. A return to an emotional process in design is more relevant now than ever. In David’s eyes, the design world has arguably become more homogeneous as technology has developed. However, this is not to say that technology cannot be used to create emotional design. “That’s where the best work comes from–your unique vision and way of seeing things and nobody can copy that. Everybody can buy the same software and do reasonable websites but as we get more technically driven, it’s more important than ever that you get personally involved in the work. That’s when you do your best work and have the most fun doing it,” David believes. “That’s the only way you can do something unique because nobody is you; no one has your background, your upbringing, your family life. You can’t put all of that, but you can put degrees of it and then you have the chance to actually get some unique fresh work. If you’re not doing that then you’re probably bored with the work and you’re probably doing very safe, fine, forgettable work–professional but ultimately forgettable.” This strong belief in the importance of keeping emotion as the driving force of creativity in an increasingly digital world is why the highlight of the “Mind Over Matter” show for David was watching the emotional reactions of people as depicted by his collages. Although the next phase of their collaboration is on hold because David and Thjis are in pursuit of different projects, the possibilities of where they may take the theme of the connection between emotion, image, and technology are broad. Although the team is not yet sure what the next phase will be, they would love to continue. Themes of self-awareness, couples’ therapy, peer surveillance, and emotional authenticity in a technologically-driven world are some ideas they have of ways this technology could be used to help make a real difference in the world – the main goal of their collaboration.